By mid-summer cucumber recipes are a hot commodity: a day doesn’t go by without my receiving a comment or an email about cukes. Everyone, it seems, is trying to find some new recipes for the bumper crop growing in their backyard. 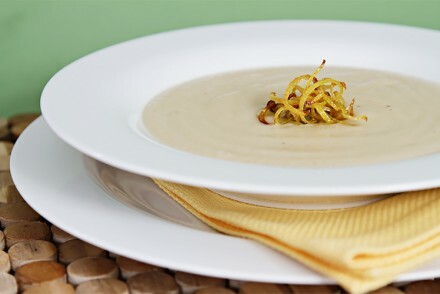 So it stands to reason that by August, one of the most popular recipes on this eMagazine is my chilled cucumber soup with yogurt and fresh mint. I thought it was time to publish another version, one that takes advantage of yet another mid-summer bumper crop: peppers! 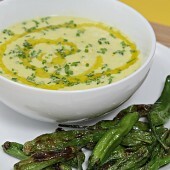 Today’s chilled soup is made with snappy seedless cucumbers and firm, zesty, locally grown yellow peppers. The goat milk yogurt adds a lovely tang to the soup. And for a bit of fun, I like to serve the soup with seared shishito peppers – tiny heirloom Japanese peppers – on the side. Shishito peppers are mildly spicy and altogether succulent. Sautéed whole until they blister, sprinkled with salt and served warm, they literally melt in your mouth! It’ll be cucumber and pepper season until first frost, so there’s still plenty of time for you to enjoy cooking and eating with these lovely veggies! 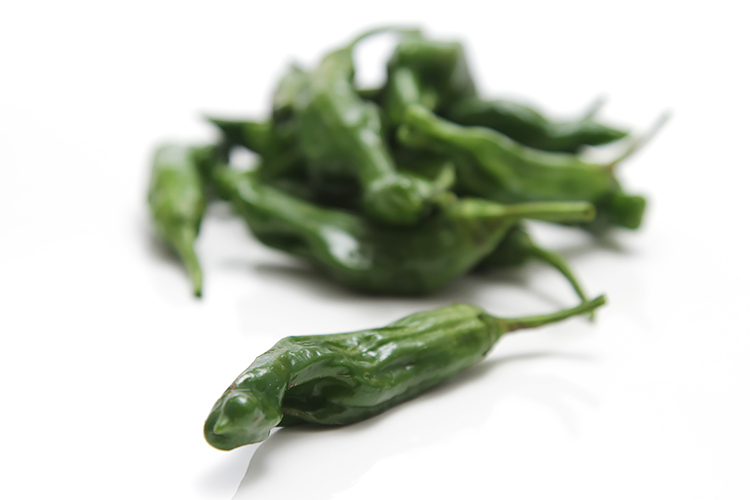 Here are more recipes with shishito peppers. 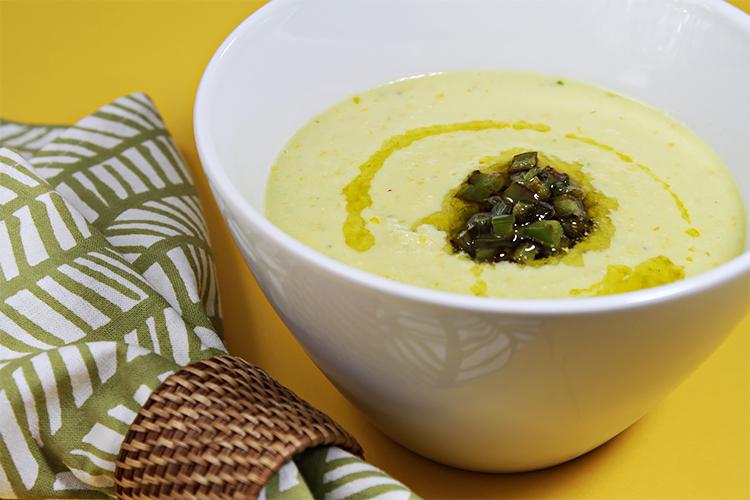 A Sauvignon Blanc is a simple but superb pairing with this chilled soup! Step 1: To make the soup, place all ingredients in the bowl of a food processor. Pulse a few times until the ingredients are coarsely chopped. Scrape the sides of the bowl, then process until very smooth, about 2 to 3 minutes. Transfer to a bowl and refrigerate 2 hours or overnight, until well chilled. Place the soup in the freezer for 30 minutes before serving. 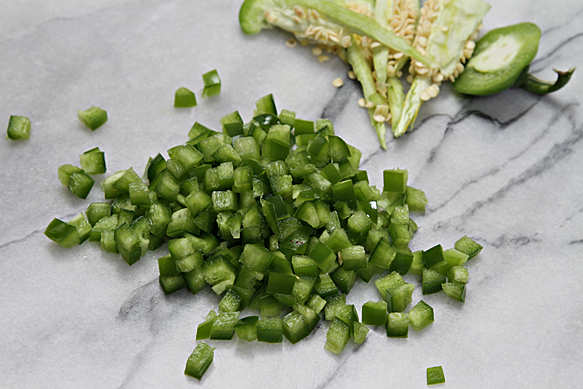 Step 2: Before cooking the peppers, make a small slit in each pepper with a paring knife. This will prevent them from bursting when they cook. Heat a large heavy-bottomed skillet over medium-high heat. When the pan is hot, add the oil and peppers and toss well. 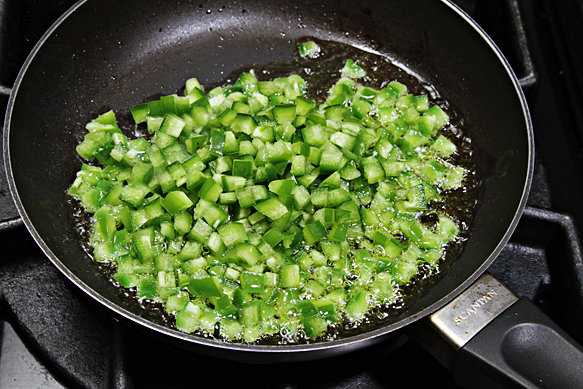 Sauté for 4 to 5 minutes until peppers are golden-brown and blistered, tossing only occasionally. Transfer to a tray lined with paper towels and sprinkle with the salt. Set aside. 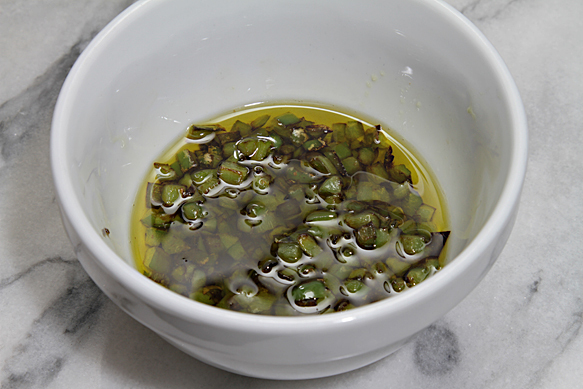 Step 3: Spoon the chilled soups into bowls, sprinkle with chives and drizzle with a little extra virgin olive oil. Serve with the warm pan-roasted shishito peppers on the side. 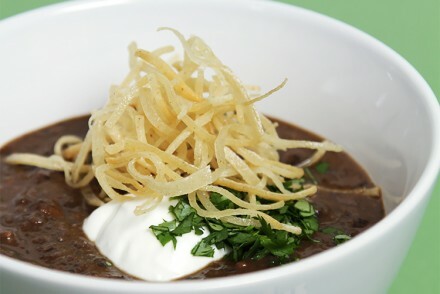 Cook’s note: The soup can be refrigerated up to 2 days. Can’t find shishito peppers at your local farmers’ market? 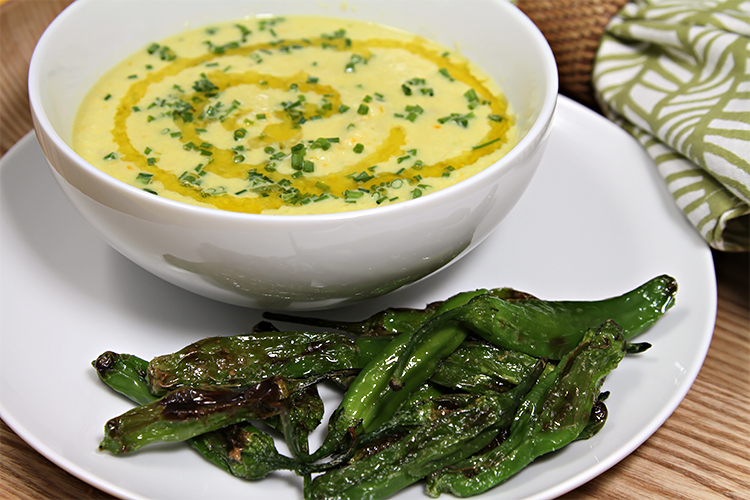 Try serving the soup with pan-roasted jalapeños peppers. It adds a lovely bite to this cooling soup! 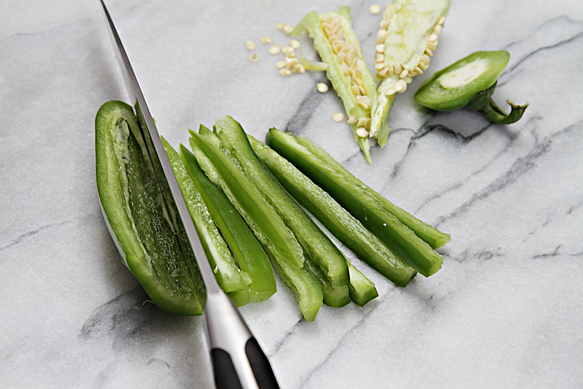 Stem, seed and cut four jalapeño peppers in 1/8″ slices. Cut the slices crosswise in 1/8″ dices. Heat a small frying pan over medium-high heat. Add 2 tablespoons of olive oil and the jalapeños. Stir well, until the peppers are well coated with the oil. Sauté for 3 to 4 minutes until golden-brown, stirring only occasionally. 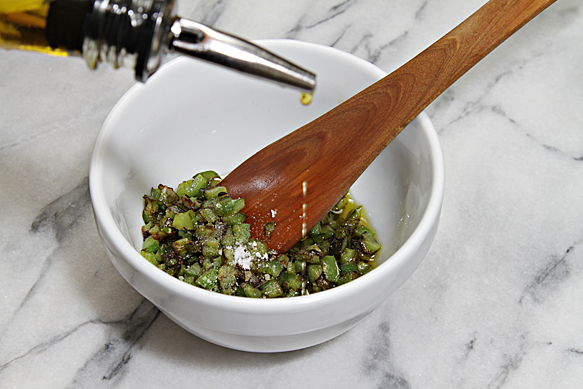 Transfer to a bowl, and while the peppers are still hot, add 1/8 teaspoon sea salt and 2 tablespoons extra virgin olive oil. 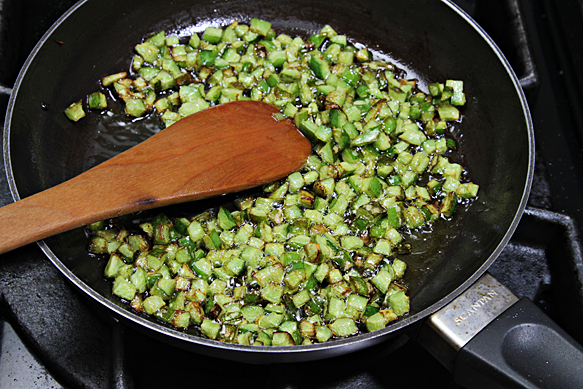 The olive oil will become infused with the flavors of the pan-roasted peppers. Stir and let stand at room temperature until ready to serve. If making ahead of time, refrigerate for up to 3 days. Bring to room temperature before serving. Spoon a heaping teaspoon of the sautéed peppers in the center of each soup. Drizzle with the infused olive oil and serve! I love cold soups! Thanks for bringing this one to my attention. I missed it and I want to make it! Yellow pepper is a brilliant pairing with cucumber. We’re fans of shishitos too. Fabulous! I love cucumber soup and I bet the heat from the jalapenos give if an incredibly complex flavor 🙂 Well done! This is such beautiful recipe!!!! Full of flavors and such wonderful texture. I love the way you play with food, so inspiring. I don’t know how you do it. You consistently make the most elegant recipes I’ve ever seen. Simply gorgeous. What a beautiful summer dish! I love the goat milk yogurt, it must balance the soup perfectly! A great recipes with beautiful photos..as always. 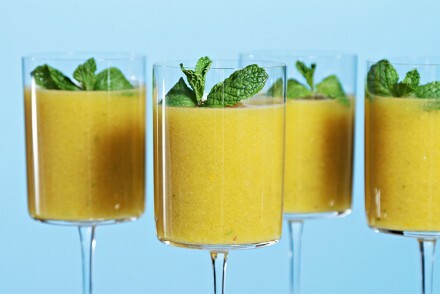 Love the spicy touch on this refreshing chilled summer soup. Have a relaxing and delicious weekend! Beautiful photo’s viviane and it really looks delicious! A huge thank you to all of you for your wonderful comments! I’ve never tried shishito peppers, but they look great. I’m always looking for ways to use up my surplus of produce and this soup looks like a wonderful summer meal. Looks mahhvalous! Nice twist with the goat’s milk yogurt – I’m sure that’s delicious! Love the colors, so pretty! This soup is absolutely gorgeous. I love the vibrant color, and I am totally keeping my eyes peeled for shishito peppers at the market this weekend!! Trix, I hope you find Shishitos – they’re superb little peppers! Thank you so much for your kind words.